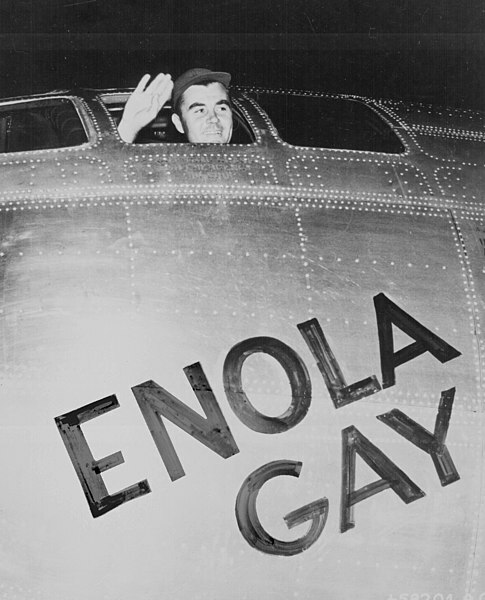 Enola Gay is the B-29 bomber that dropped the atomic bomb on Hiroshima. Colonel Paul Tidbits named the bomber after his mother – Enola Gay Tibbets. Why did I decide to write about this? Well, I’ve been watching the Syfy channel show, Warehouse 13. If you have no idea what I’m talking about, you can refer to their wonderful wiki page . But in a nutshell, there are these secret service agents that retrieve artifacts that have mystical powers to them. OK… now back to Enola Gay. There was this episode where they retrieve a pair of binoculars which were used by Colonel Tibbets. He apparently use them to look at the explosion which absorbed all the emotion and horror. In the show, this the artifact absorbed the devastation and exerted the power by vaporizing its victims, as what happened in Hiroshima. So why again am I writing about this? Well because I recalled visiting Hiroshima few years ago. I went to Japan with my sister, and we traveled through out the island country with a Japanese Rail pass. On one of the legs, we took a train from Kyoto to Hiroshima. I wanted to visit Hiroshima primary because of the Peace Memorial Museum. They built the Hiroshima Peace Memorial Museum in memory of the bombing of Hiroshima. Inside, it contained models of the before and after of Hiroshima, images and a collection of items left by the people, and mock-ups of what they believe the people of Hiroshima experience. The Hiroshima Memorial Peace Museum. Architect of the main building was Kenzo Tange. I admired the simplicity of the design of the building. We spent a couple of hours in the museum. There was a lot to see, but all of course was very horrific. It does, however, satisfy a morbid curiosity of what happen during that time. When we decided to leave, it was a very nice scene outside the museum. The sky was clear, and the sun was shinning. Kids were running around; many were in town to visit the museum for a field trip. You can find more information about the Hiroshima Peace Memorial Museum by visiting their website.